Believe it or not, the substrate is the most important part of a hermit crab habitat. They rely on it being there so they can burrow into when it’s time to molt. It protects them during the process and is essential to their health and well-being. That’s why getting the best substrate for hermit crabs is such an important decision. 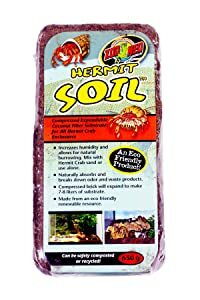 How Much Substrate for Hermit Crabs? How to Clean Hermit Crab Substrate? Now that you know how important substrate is to your hermit crabs, let’s look at some of the best options available. Here are the best hermit crabs substrates we recommend. Fluker’s knows that hermit crabs like to dig and how important it is to fill their habitat with the right substrate. A lot of sand sold for hermit crabs is purely calcium carbonate, which is made of small pieces of broken shells. Fluker’s uses something different. This All Natural Premium Sand is actually a blend of all-natural silica sand, coconut fibers, sea salt, calcium carbonate, and an added probiotic. Together, these ingredients form the perfect mixture for burrowing, but each one also serves a specific purpose. The silica sand and coconut fibers retain water. Sea salt is added to replicate the natural oceanside habitat and the probiotic helps keep the substrate clean by supporting the growth of beneficial bacteria that break down organic waste. 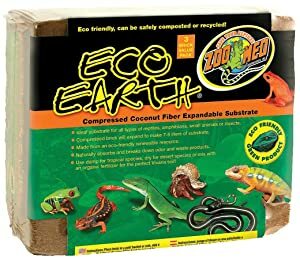 This substrate from Zoo Med is made of eco-friendly, renewable coconut fiber. Coconut fiber is ideal for hermit crabs because it holds moisture and increases humidity in their enclosure, which makes it easier for them to burrow. Another great thing about it is it naturally absorbs and breaks down waste so it helps keep your hermit crab’s habitat clean. This substrate comes in a large, compressed brick but quickly expands when you add some water. 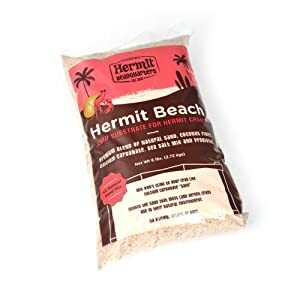 It can be used its own or add it to your favorite sand substrate to add more moisture and help make it easier for your hermit crabs to burrow. If you’re looking for a way to add a pop of color to your hermit crab’s habitat, this bright, beautiful blue terrarium sand might do the trick. Don’t worry, the pigments are completely natural and safe for your pet. 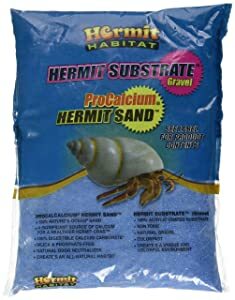 This substrate is a great source of the calcium carbonate hermit crabs need to grow and form an exoskeleton. It’s 100% digestible and contains no silica or phosphates. That’s not all, it’s also a great consistency for burrowing and a natural odor neutralizer, too. This pure coconut fiber substrate from Zoo Med is made from the husks of real coconuts. It’s environmentally friendly, sustainable, and can be safely composted or recycled. It comes in a compressed brick so you’re actually getting a lot more than what it looks like. Just add some water and the fibers will expand, making the perfect environment for hermit crabs to burrow. One more great thing about this product is that it naturally absorbs and breaks down any odor and waste, keeping your crab’s environment clean and healthy. You can use it on its own or add it into your favorite sand substrate to introduce more humidity for easier burrowing. 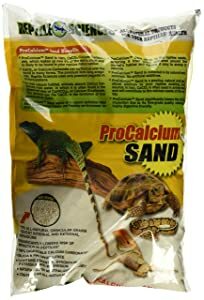 This sand substrate from Reptile Sciences is made of 100% natural calcium carbonate sand. It’s collected from all natural sources and is silica and phosphate free. The fine texture is really great for two reasons: it’s 100% digestible and just right for burrowing. Another great thing about this product is the natural white color. It looks really natural and can help you create an environment that’s similar to the one hermit crabs live in in the wild. This sand is also a natural odor neutralizer which is very useful between cleanings. As we mentioned, the substrate is the most important part of keeping a pet hermit crab happy and healthy. In the wild, they have access to everything they need in their natural environment. When you keep them as pets, it’s your responsibility to provide it for them. In nature, hermit crabs burrow underground when it’s time to molt. One reason is they need darkness to trigger their bodies to start the process. Once they shed their old exoskeleton, they’re vulnerable to predators. Not only do they not have protection, but they’re also unable to control their muscles until the new exoskeleton hardens. That’s why being able to hide is so important. Some hermit crabs can stay buried for up to 3 months while they wait for this process to complete. Therefore, it’s important to have a deep, moist substrate that requires very little maintenance during this time so as not to disturb them. The kind of substrate you use is important but there are two other things you need to ask yourself. Are you using enough substrate? And, is it wet enough? To some degree, how much substrate you need depends on the size of the hermit crab. Small hermit crabs that are roughly dime to quarter size need no less than 6 inches of substrate. Large hermits crabs that are the size of baseballs need a substrate that’s at least 12 inches deep. A general rule of thumb is that the substrate should be deep enough that the largest hermit crab in your habitat can dig to a depth that is 2 to 3 times their size. Remember, though, using the right amount of good substrate isn’t quite enough. Moisture is absolutely critical. Hermit crabs create an underground cave with plenty of airspaces to molt. If the substrate is too dry, they won’t be able to dig the tunnels and caves they need. Everything will collapse in on them as they try to dig down. How wet should the substrate be? Roughly the same as packing sand or the consistency you would need if you were attempting to build a sandcastle on the beach. Just like any pets that live in a confined space, a hermit crab habitat can get very messy which can lead to strong smells and a lot of bacterial growth. Not only will this cause your pets’ stress, it can also make them sick. A clean tank is a happy tank. How often the habitat needs cleaning depends on a few things: how many crabs you have, how big they are, and how large the habitat is. A large tank with only a few small crabs can go longer between cleanings than a small tank with a large hermit crab. Ideally, you should check the substrate every day and clean up any obvious messes from the surface of the substrate. Use a simple sand scoop to remove debris or any clumps. If you see any signs of mites or flies or if you notice any strong smells, a deep clean is needed. So, how do you deep clean substrate? First of all, you have to prepare for it by having a second temporary home ready for your pets. Humidity, moisture, and temperature are all very important for hermit crabs so have this secondary home ready to go ahead of time. Cleaning the substrate at the bottom of the tank isn’t easy and it’s often easier to replace it with new material. If there are some hard to clean spots on the surface, use hot water or a vinegar solution to scrub it clean. Hermit crabs are very sensitive and most cleaning solutions will be too harsh for them, especially bleach. While you’re doing a deep clean of the substrate, make sure you pay attention to the rest of the habitat, too. Take out any empty shells and toys and boil them in plain water for a few minutes to disinfect them. Any wood or living plants should be wiped down with hot water, too. Hermit crabs are smart. They can get bored so swap out toys and different obstacles with each cleaning. Hermit crabs are really cool pets and part of what makes them so interesting is watching them molt. To do this, they need to burrow down into the substrate and make a safe little cave for themselves while they wait for their new exoskeleton to harden. It’s for precisely this reason that choosing a substrate is one of the most important decisions you’ll have to make as a hermit crab owner. That said, keep in mind it’s important to use the substrate in the right way. You have to make sure it’s deep enough and wet enough for you hermit crabs so that they can use it effectively when it comes time to molt. See Also: How to Take Care of Hermit Crabs?